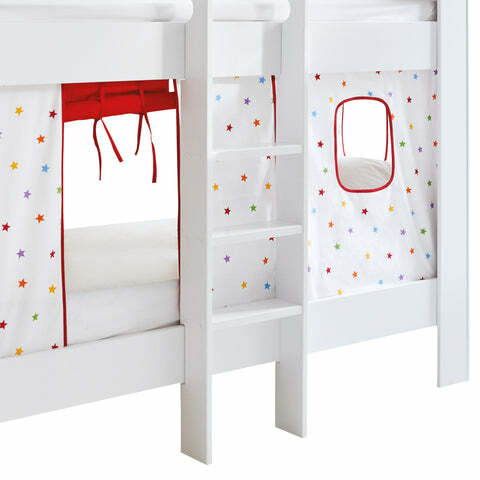 Paddington Bunk Bed with Play Curtains, Rainbow Stardust | Great Little Trading Co.
Bunk beds are always the best fun as far as kids are concerned, but this beauty has the added joy of those gorgeous play curtains (there's enough room for you grownups to snuggle in on the bottom bunk too). We also love that it suits any room layout thanks to a centralised ladder, and you can team it up with our Underbed Storage Drawers to add extra storage space. All our raised beds and bunk beds are designed and tested to the appropriate British Standard (BS EN: 747); they also include our own Five Year Warranty. 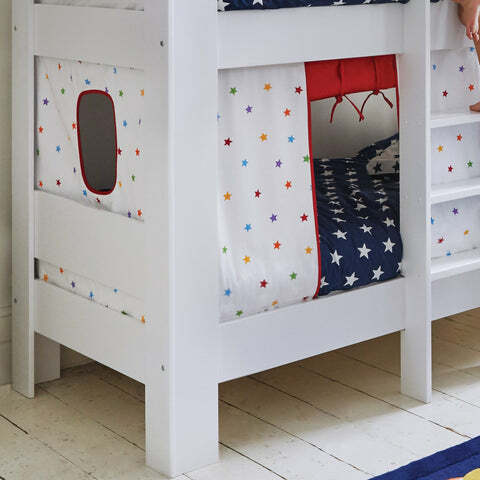 The Paddington Bunk is made from tough MDF with rounded, child-friendly edges and solid pine, slatted bases; it's finished in Bright White. The 100% cotton play curtains are easy to take down and are machine washable. This bed requires two standard UK Single mattresses. For the lower bunk we recommend our Luxury, Extra Deep mattress; the top bunk requires a shallower depth mattress, so we can only recommend our Luxury, All Rounder mattress. For more information please see our Mattress Buying Guide.